Pola is the largest city of Istria and the former capital of Istria. Today it is located in Croatia, but for approximately 2,000 years it was part of Italy and the historic Italian states. In prehistoric times Istria was inhabited by the Euganei, a proto-Italic or Ligurian tribe, followed by the Veneti, an Italic tribe, and the Histri. The Histri, from whom Istria derives its name, were a tribe of pirates related to the Veneti of northeastern Italy. On the site of today's Pola there existed seven hills, situated at the head of a gulf, along the southern coast of the Istrian peninsula. On these seven hills is where the city of Pola – in imitation of Rome – was later built. Pola originated in 178-177 BC as a Roman military post during the Second Istrian War. In 46-45 BC it was established as a Roman colony and was settled by Italian colonists. Traditionally, the founders of the colony are said to have been Lucius Calpurnius Piso (father-in-law of Julius Caesar) and Lucius Cassius Longinus (brother of Gaius Cassius, who later assassinated Julius Caesar). Within a few years the population of Pola grew to about 30,000 and became a major Roman port. The city was destroyed in 43-42 BC during the Liberators' Civil War, part of the Roman Civil Wars. The war was fought between the forces of Mark Antony and Octavian (the future Emperor Augustus) against the forces of Brutus and Cassius, who assassinated Julius Caesar. The city of Pola sided with Brutus and Cassius, and therefore was razed to the ground by the forces of Octavian. Emperor Augustus later rebuilt Pola at the insistence of his daughter Julia and renamed it Colonia Pietas Iulia Pola Pollentia Herculanea. It once again became an important Roman city and colony. In 29 BC the Roman Arena began construction. Also in 29-27 BC the triumphal Arch of the Sergii was built to commemorate the Roman Sergii family, who fought in the Roman Civil War (44-31 BC) and became one of the most important patrician families in the colony of Pola. During the same period the Porta Ercole (Gate of Hercules) was built; the names of the two Roman founders of the city were inscribed on the top of the entrance. 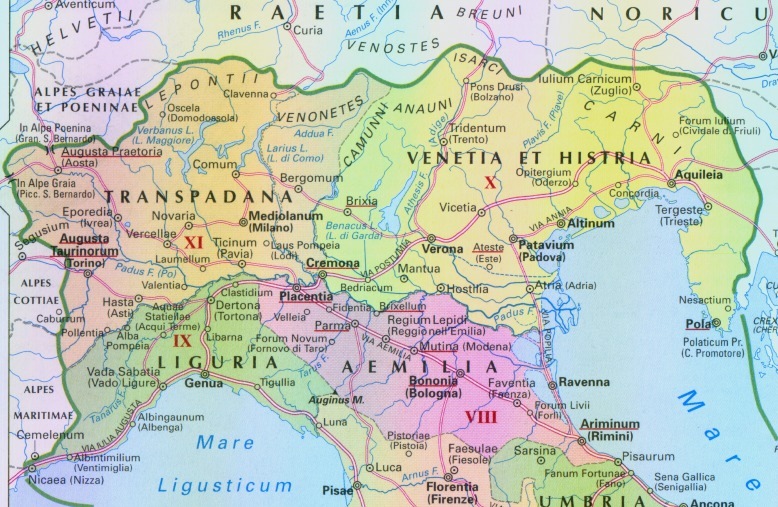 In 12 BC the city of Pola, together with the rest of Istria, was included in Regio X Venetia et Histria (the tenth region of Italy), with the city of Aquileia as the capital. 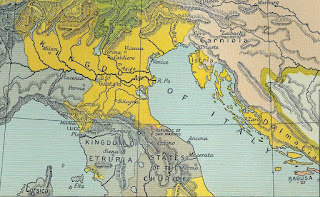 Pola, together with Istria, became an integral part of Italy and would be connected to Venetia for the next several centuries. Many structures were built in Pola by the Romans. The Temple of Augustus was completed in 14 AD, while the Roman Arena was completed by 68 AD. A temple dedicated to Jupiter Conservator, as well as Roman thermae (baths), were built on the site of the current Pola Cathedral. The Porta Gemina (Twin Gates) was constructed in the 2nd century AD to fortify and defend the city. Under the Antonine emperors, Pola reached its peak with 35,000 inhabitants. Christianity reached Capodistria as early as 56 AD, but early records of Christianity in Pola before the 3rd century are scarce. St. Germanus – the first martyr of Pola – was martyred in the Pola Arena in 274 or 284. The Roman baths of Pola were used as a meeting place by Christians during the Diocletianic Persecution (303-311). The first Christian churches were built in Pola in the early 4th century. Christianity was already well-established in Pola by the time of Emperor Constantine. In the 4th century two major executions took place in Pola. Crispus, the first-born son of Constantine, was condemned to death and executed by a local Roman court in Pola in the year 326. Constantius Gallus, Caesar of the Roman Empire and a member of the Constantinian dynasty, was also sentenced to death by a Roman court and executed in Pola in 354. In 476 Italy was invaded by barbarians, who deposed Romulus Augustulus, the last Western Roman Emperor. During the invasion the city of Pola was nearly entirely destroyed. Istria was subsequently included in the Kingdom of Italy under Flavius Odoacer, King of Italy. In 493 Odoacer was assassinated by the invading Ostrogoths and Istria was included in the Ostrogothic Kingdom of Italy under Theodoric. St. Maximianus, the future Archbishop of Ravenna, was born in Pola in 498. In 538 Istria was recaptured by the Romans during the Justinian reconquest of Italy. However, Italy was invaded by the Longobards in 568, causing the ancient Italian region of Venetia et Histria to become divided: most of Venetia fell to the Longobards, while Istria remained under the Romans. The Exarchate of Italy was established by the Romans in 584 and Pola, together with the rest of Istria, was included in the Exarchate of Italy under Decius, the Roman Exarch of Italy. 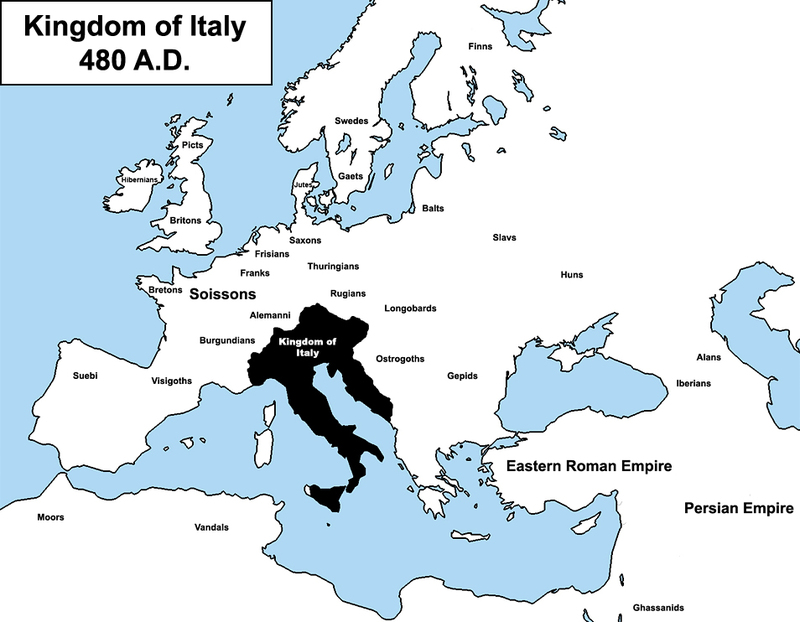 Pola remained part of the Exarchate of Italy, within the Eastern Roman Empire, for the next two centuries until the year 751, when Istria was conquered by the Longobards and incorporated into the Longobard Kingdom of Italy under Aistulf, King of Italy. 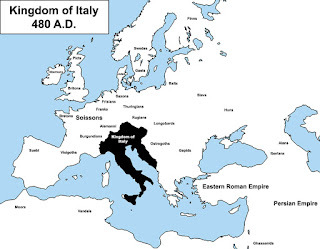 This short-lived occupation ended in 788-789, when Istria was captured by the Franks and subsequently included in the Carolingian Kingdom of Italy under Pepin, King of Italy. As part of the Kingdom of Italy, Istria was initially included in the March of Friuli, which was established in 776 as a defensive frontier land within the Kingdom of Italy. In 799 the March of Istria was established as a frontier march of the Kingdom of Italy, fulfilling the role previously undertaken by the Duchy of Friuli. The March of Istria was designed to protect Italy from invaders, specifically to keep the Avars, Slavs and Magyars out of Italy. Pola, together with the rest of Istria, remained part of the Kingdom of Italy for the next century and a half. In 952 Otto I of Germany invaded and conquered the Kingdom of Italy. Istria was seized by Otto I and given to the Dukes of Bavaria. In 976, after 24 years under the Bavarian Dukes, Istria was briefly given to the Dukes of Carinthia. This has caused some people to mistakenly assume that Istria, including the city of Pola, became separated from Italy for the first time in recorded history, after being part of Italy for more than 1000 years. However, despite being directly subjected to the German Dukes, Istria was still regarded as formally belonging to the Kingdom of Italy, rather than to the duchies of Bavaria or Carinthia. This is confirmed by a document from the Istrian city of Parenzo dated to 1014, in which we find the phrase “Hic in Italia” (“Here in Italy”). In a later document, dated to 1177, Frederick I Barbarossa lists the Istrians among the people subject to the Kingdom of Italy. In 992 the city of Pola offered itself as a vassal to the Republic of Venice in gratitude for the Venetians defending Istria against the raids and incursions of the Slavs. In 1001 the church of Santa Maria Formosa – built by St. Maximianus of Ravenna in 547 – was given to the Archbishops of Ravenna, recognizing the centuries-old link between Pola and Ravenna (the Diocese of Pola, founded in the 6th century, was initially a suffragan of the Archdiocese of Ravenna). In 1028 the Diocese of Pola was placed under the ecclesiastical jurisdiction of the Patriarch of Aquileia. In the same year the Bishops of Pola were given temporal power and several Istrian cities, including Fiume, were placed under their temporal authority. Thus Pola briefly became part of its own ecclesiastical feudal principality under the Bishop of Pola, who was given the title of “Count”. In 1040 the March of Istria was reestablished by Henry III of Germany as an imperial march of the Holy Roman Empire; Istria, including Pola, was given to Poppo I of Weimar, Margrave of Istria, and Pola became the seat of the Margraves of Istria. But just 37 years later, in 1077, the Patria del Friuli was established and the March of Istria came under the temporal rule of the Patriarchs of Aquileia. Pola became a tributary of the Republic of Venice in 1148. Two years later, in 1150, Pola swore allegiance to Venice. 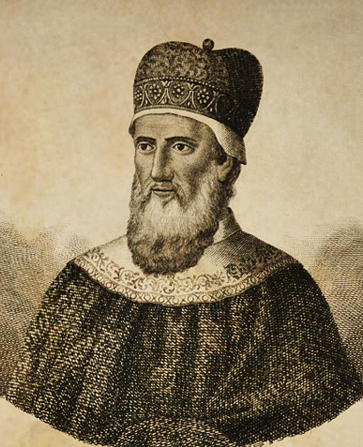 In the same year Domenico Morosini, Doge of Venice, was proclaimed Totius Istriae Dominator (Lord of All Istria). In 1177 Pola obtained the status of a free city, and received its first podestà (mayor), but remained under Venetian influence and continued to pay tribute to Venice. Pola was briefly captured by the Pisans in 1195, but was returned to Venice. In 1233-1239 Pola began to renegotiate its old relationship with the Patriarchs of Aquileia, and in 1242 a war broke out: the pro-Aquileian faction within Pola took control of the city and declared war on Venice. The Venetians attacked Pola, causing damage to the Cathedral. The pro-Aquileian faction was defeated and soon after the city of Pola once again swore allegiance to Venice. The ancient Italian family of the Sergi, local leaders of the city of Pola since Roman times, changed their name to Castropola and declared themselves Lords of Pola in 1271. The family was slaughtered in Pola during a religious procession on Good Friday in 1271 by a rival faction led by Andrea di Tonata (also called Andrea di Ionata, a member of the Gionatasi family) and was nearly entirely exterminated. According to tradition the only survivor was a young boy, who carried on the lineage of the Sergi-Castropola family, which later became known as the House of Pola. The Peace of Treviso forced Venice to give up several Istrian cities, including Pola, to the Patriarch of Aquileia in 1291. Pola became part of the Patria del Friuli, under the Patriarchs of Aquileia, for the next 40 years. However, local power resided with the Sergi-Castropola family, who remained the Lords of Pola and dependent on Aquileia until 1331. In 1331 the Sergi-Castropola family was permanently expelled from Pola after a popular uprising led by the Gionatasi family. The city of Pola swore perpetual allegiance to Venice and remained part of the Republic of Venice for the next four and a half centuries, until its demise in 1797. 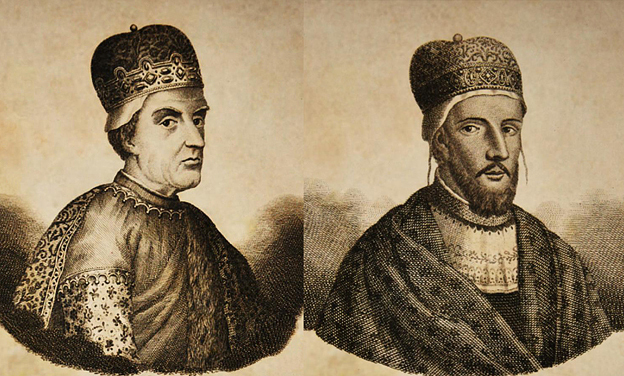 The deep historical connection between Pola and the Republic of Venice could be seen even before the Venetian period. Between the 9th and 12th centuries, when Istria was still part of the Kingdom of Italy and later the Patria del Fiuli, two native-born Istrians from Pola became Doge of Venice: Pietro Tradonico (838-864) and Pietro Polani (1130-1148). Both descended from noble Italian families which had lived in Pola for centuries. At the beginning of the Venetian period Pola had a population of approximately 6,000 inhabitants. Under the Republic of Venice, Bertuccio Michiel was nominated as the first Count of Pola (1331-1332). In 1334 the people of Pola sent a request to the Venetian Senate, asking them to destroy the castle and homes of the Castropola family, to prevent the city from falling into their hands again. The castle and homes were demolished and the Castropola family never again returned to Pola. The Black Death swept through Istria in 1347-1348, killing two-thirds of the overall Istrian population and one-fifth of the population of Pola. The pandemic killed entire families, including fifty patrician families in Pola which went extinct. In 1378-1381, during the War of Chioggia between Venice and Genoa, Pola was burned and sacked by the Genoese. The city was almost entirely destroyed, but was rebuilt and fortified by the Venetians. The Venetians also made repairs to the Pola Cathedral, which had been previously damaged during the war of 1242, and also constructed a sacristy. In 1412 Italian colonists from Pola were sent to settle the Brioni Islands, a group of fourteen small islands off the coast of Pola which had been depopulated since the Plague of 1312. The Statuto di Pola (Statue of Pola) was promulgated in 1431 by Giusto Venier, Count of Pola. In 1437 Istria was struck by another plague which devastated the city of Pola. In 1487 Michele Orsini, Bishop of Pola, dedicated the altar of the Pola Cathedral to several early saints whose bones were located under the main altar of the church. Their names were St. George, St. Demetrius, St. Theodore, St. Basil and St. Florus. The remains of King Solomon of Hungary, who died in Pola in 1087, were also later discovered under the Cathedral. The city was attacked in 1607 by a band of Slavic pirates known as the Uskoks, which led to the Uskok War (1615-1618) between Venice and the Habsburgs. The Fortezza di Pola (Pola Fortress) was built in 1630. Also in 1630-1631 Istria was struck by the Bubonic Plague, the final plague to hit Istria, which devastated the city of Pola and the neighbouring Istrian cities. The population of Pola was reduced to just 350 inhabitants. Already in 1626 Giulio Contarini, the Provveditore in Istria, had described Pola as a “city of corpses” (“cadavero di città”). In 1707 the Venetians built the Campanile (bell tower) next to the Pola Cathedral using stones from the Roman Arena. The facade of the Cathedral was rebuilt in 1712 by Giuseppe Maria Bottari, Bishop of Pola. By the end of the Venetian period Pola had approximately 600 inhabitants. In 1797 Pola was occupied by the forces of Napoleon and the Habsburgs, and the Republic of Venice was forcibly dissolved after 1100 years of existence, losing its independence and territories. The Treaty of Campo Formio was signed on October 18, 1797 and Pola, with the rest of Istria, was annexed by the Habsburg Monarchy. In 1804 the Habsburgs established the Austrian Empire. In recognition of its millennial connection with Venetia, Istria was included in the Venetian Province (Duchy of Venice) within the Austrian Empire. After the Peace of Pressburg on December 26, 1805, Istria became part of the Kingdom of Italy under Napoleon, King of Italy. Public education became mandatory and Italian was recognized as the official language. However a mere four years later the Treaty of Schönbrünn, signed on October 14, 1809, tore Istria away from Italy and assigned it to the Illyrian Provinces within the French Empire. After its incorporation into the Illyrian Provinces, Pola remained governed by Italians: Domenico Bradamante (1809) and Giuseppe Muazzo (1811-1813). After the Congress of Vienna in 1815, Istria was annexed again by the Austrian Empire, where it remained until the end of the First World War. Istria was initially included in the Kingdom of Illyria within the Austrian Empire, but in 1825 it was politically separated into its own administrative unit known as the District of Istria. In 1849 the Habsburgs created the Margraviate of Istria and the Austrian Littoral; the Margraviate of Istria was included in the Austrian Littoral within the Austrian Empire, with the status of a Crown Land. In 1856 the Austrians established a new naval arsenal in Pola. 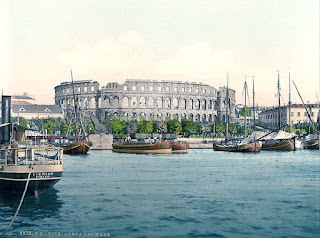 The city became a major port and in 1866 became the military capital of the Austrian Navy, leading to a massive increase in immigration, attracting not only Italians, but also Slavic peasant-workers and German military personnel. From only 1100 inhabitants in 1850, the population of Pola grew to 10,400 in 1869 and to 25,100 in 1880. This led to the sudden extinction of the local Italic dialect, known as Istriot, which had been natively spoken in the city of Pola for centuries. The antecedents of this anti-Italian policy could be felt in Pola as early as 1857 when Juraj Dobrila, a Croatian nationalist priest, was appointed Bishop of Parenzo and Pola by Emperor Franz Joseph, despite these two cities having almost exclusively an Italian population at the time. Dobrila was very active in Austrian politics and advocated the slavicization of Istria, Dalmatia and Trieste. The Austro-Hungarian Empire was established after the Austro-Hungarian Compromise of 1867; the Margraviate of Istria remained part of the Austrian Littoral within the Austro-Hungarian Empire. The old Christian baptistry, built by the Romans in the 5th century, was demolished by the government in 1885 in order to expand the courtyard of the Admiralty building (Ammiragliato). In 1915 Italy entered the First World War and declared war on the Austro-Hungarian Empire. Many Italians from Istria enlisted in the Italian military, hoping to liberate their land from Austrian rule. 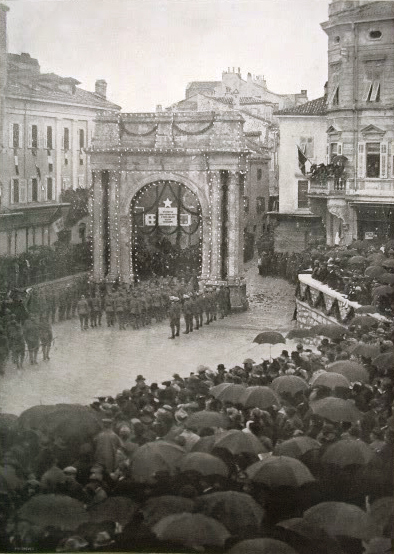 One such soldier, naval lieutenant Nazario Sauro, who was born in Capodistria, was captured and executed in Pola by the Austrians on August 10, 1916 on charges of high treason. His final words were: “Viva l'Italia! Morte all'Austria!” (“Long live Italy! Death to Austria!”). On the night of October 31 and morning of November 1, 1918 Italian frogmen sunk the battleship Viribus Unitis at the Austro-Hungarian naval base in Pola in a daring event known as the Pola Exploit (Impresa di Pola). Italy defeated Austria in the Battle of Vittorio Veneto on November 3, 1918, causing the collapse of the Austro-Hungarian Army and the eventual dissolution of the Austro-Hungarian Empire. The Italian Royal Navy occupied Pola Harbour on November 5, 1918 and the entire Austrian navy and mercantile marine surrendered to Italy, in accordance with the terms of the Armistice of Villa Giusti. Italian troops entered Pola the same day, liberating the city and annexing it to the Kingdom of Italy. 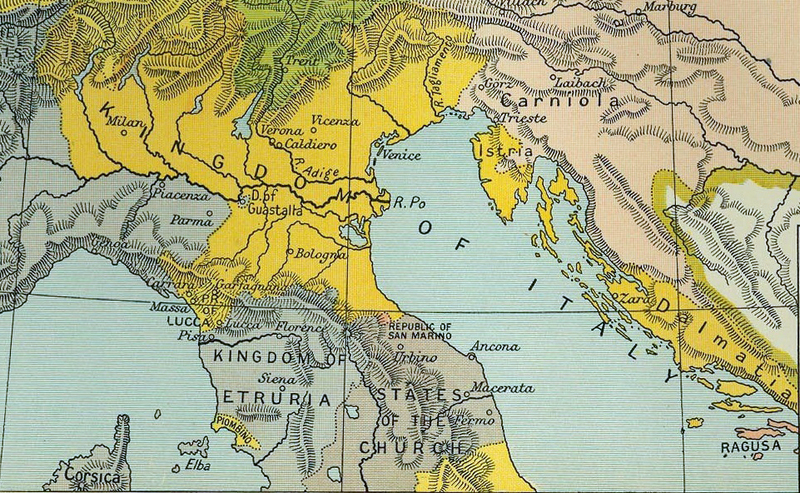 On September 10, 1919 the Treaty of Saint-Germain-en-Laye was signed, confirming Italian territorial claims; Pola and the rest of Istria was officially returned to Italy after a century under the rule of the Habsburgs. In the Treaty of Rapallo, signed on November 12, 1920, the Kingdom of Serbs, Croats and Slovenes (later renamed Yugoslavia) also recognized Italian sovereignty over Istria and the other Italian territories previously belonging to the Austro-Hungarian Empire. Istria was incorporated into its own province within the Kingdom of Italy, with Pola as the capital, called the Province of Istria (Provincia dell'Istria) or Province of Pola (Provincia di Pola). The 1921 census showed that the Province of Istria had an ethnic Italian majority, with 199,942 Italians (58.2%); 90,262 Serbo-Croats (26.3%); 47,489 Slovenes (13.8%); and 5,708 Other (1.7%). In the city of Pola there was a total of 49,323 inhabitants: 41,125 Italians (91%) and 5,420 Croats (9%). Italian-Istrian culture flourished in the Kingdom of Italy. 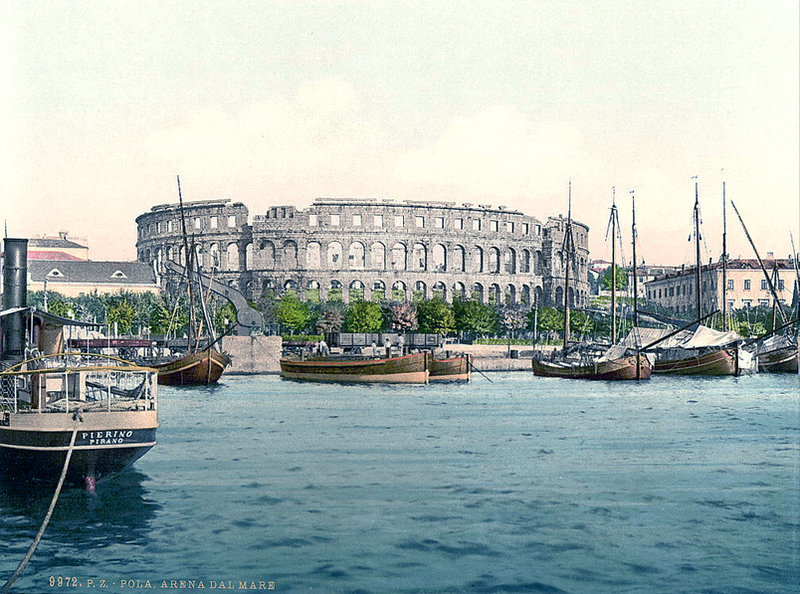 In August 1933 the summer opera season was inaugurated at the Roman Arena in Pola. The first performance was “Nozze istriane” (“An Istrian Wedding”) by Antonio Smareglia, a native-born Italian composer from Pola. The performance attracted spectators from all over Istria and Trieste. On September 8, 1943, during the Second World War, the Armistice of Cassibile between the Kingdom of Italy and the Allied Powers was declared, causing Italian troops to become divided and forced to choose between loyalty to the Allies or the Axis Powers. In the midst of this chaos, Istria was briefly occupied by the Yugoslav Partisans of Josip Broz Tito, the future Communist dictator of Yugoslavia. During the Yugoslav occupation many Italians were murdered and thrown into large pits or sinkholes, now known as the Foibe Massacres. By October 1943 the Axis forces pushed out the Yugoslavs and the Italians regained control of the area, where they discovered the first victims of the Foibe. Italy was now also divided in two: the Kingdom of Italy in southern Italy and the Italian Social Republic (RSI) in northern and central Italy. With Italy divided, Istria became part of the Italian Social Republic, included within the Operational Zone of the Adriatic Littoral (OZAK). Pola suffered its first air raid by the Allied Powers on January 9, 1944, around 11:30 AM. The bombing killed more than 70 civilians, including Aldo Fabbro, a 25-year old footballer from Naples. Pola suffered another violent bombing on February 25, 1944. 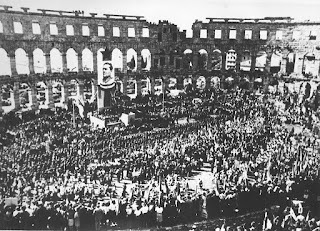 Pola was bombed again by the Allies on June 8, 1944, the Feast of Corpus Christi, damaging the Palazzo del Tribunale (Courthouse) and nearly destroying all the courthouses of Pola. On June 22, 1944 Pola was bombed again by the Allies, severely damaging the Pola Cathedral. The city was bombed by the Allies three more times in 1944—on July 21, November 26 and December 2, 1944. During the latter aerial bombardment, Monte Paradiso – an area of Pola with many villas – was struck by bombs; also struck was the Palazzo della Prefettura (Palace of the Prefecture) and the marketplace. In 1945 the Allies bombed Pola on at least nine more occasions—on January 20, February 1, February 7, February 13, February 17, February 19, February 20, February 27 and March 3, 1945. During the bombing of February 27, 1945, 18 civilians were killed and 30 wounded. The final Allied bombardment against Pola on March 3, 1945 was a surprise nighttime air raid. During the raid a cloister was destroyed by a 500-pound bomb. The Temple of Augustus was also damaged. Overall, between 1944-1945, about 40% of the buildings in Pola were destroyed by Allied bombs. 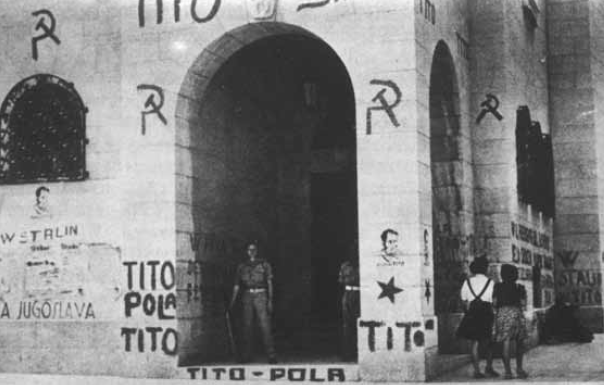 In May 1945 Italy capitulated to the Allies and Pola was occupied by the Yugoslav Partisans of Josip Broz Tito. The Italian population of Pola was persecuted and terrorized by the Yugoslavs, who occupied Pola for 45 days. The Bishop of Parenzo and Pola, Msgr. Raffaele Mario Radossi, was arrested by the Yugoslavs. After his release he sought to protect the Italian community of Pola, but was later forced to flee Istria. He was the last Italian bishop of Pola. 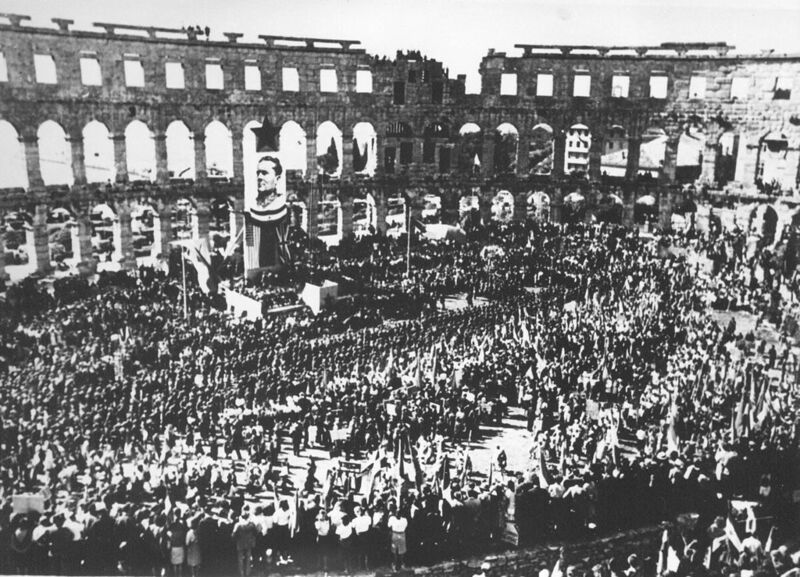 On May 13, 1945 a demonstration was staged by the Communists in the Roman Arena in Pola: hundreds of Slavic Communists filled the Arena, glorifying the victory of the Yugoslav Partisans and celebrating before a giant image of Josip Broz Tito. 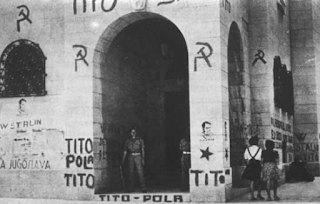 The Yugoslavs spray-painted graffiti on the walls of the city and on the ruined buildings, writing “W Tito” (“Long live Tito”), “W Stalin” (“Long live Stalin”), and “Tito-Pola”, joined with the hammer and sickle and other Communist symbols. Although occupied, Istria officially remained under Italian sovereignty until 1947. The Morgan Line was established on June 10, 1945, dividing Istria between the occupational forces of AMGOT (Allied Military Government for Occupied Territories) and Communist Yugoslavia. 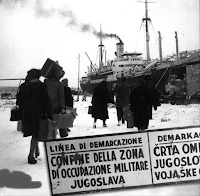 Most of Istria was occupied by the Yugoslav Communists, but on June 12, 1945 the Western Allies – United States and Great Britain – occupied Pola and the Yugoslavs evacuated. 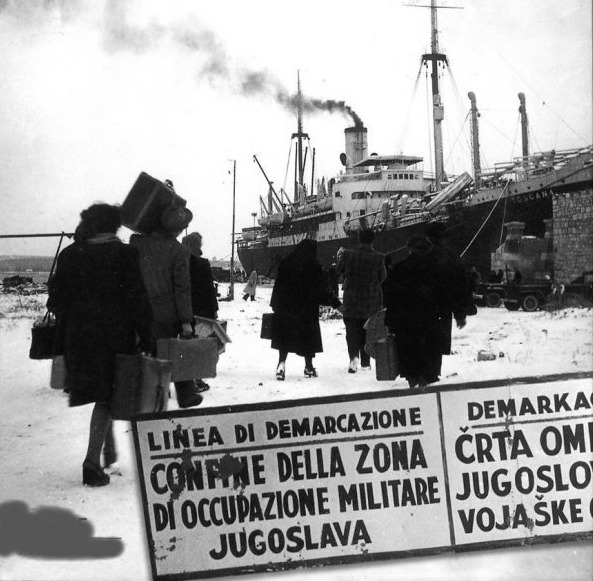 Many Italian refugees from other areas of Istria arrived in Pola, fleeing from those Istrian cities that remained under Yugoslav occupation and oppression. During the Paris Peace Conference, which lasted from July to October 1946, it became clear that Pola would eventually be given to Communist Yugoslavia. Conscious of the fate that would await them under Yugoslav rule, many Italians began to leave Pola. This was the beginning of a mass exodus that would become part of the wider Istrian Exodus or Julian-Dalmatian Exodus. On August 18, 1946 there was a large explosion in Pola, known as the Vergarola Massacre, which caused the death of approximately 75-100 Italian civilians, as well as two British soldiers. An Allied investigation revealed that the explosion was caused by torpedo warheads and TNT charges which were intentionally detonated by unknown assailants. It was never officially determined who was responsible for the attack, but it was widely believed to be a terrorist attack by the Yugoslavs—a terror tactic designed to scare the Italians into leaving Istria. Decades later this widespread suspicion was finally confirmed: the terrorist act was committed by the Yugoslav secret police. 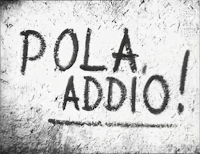 Between 1946 and 1947 Pola lost almost its entire population: an estimated 32,000 of 34,000 Italians (94% of the population) were forced to abandon their homes and property and emigrate to Italy and other countries due to fear of persecution, torture and death under Yugoslav rule. On March 20, 1947 the steamship Tuscany made its last voyage, leaving Pola for Italy, carrying with it the Istrian Exiles who were destined to live in refugee camps. After the expulsion of the Italians, Pola was left deserted and emptied. The city was subsequently repopulated by new Slavic immigrants who were transferred from other regions of Yugoslavia by the Communist government. The Serbo-Croat language was imposed as the official language throughout all of Istria. During anti-Italian riots in 1953 all the old Italian signs and placards in Pola were destroyed. Pola, like the rest of Istria, lost its 2,000 year old heritage and cultural identity; the city became croatized and was renamed “Pula”. In 1991 inner political turmoils and ethnic tension led to the collapse and breakup of Yugoslavia; in March 1991 the Yugoslav Wars began and in June 1991 Croatia declared its independence from Yugoslavia. The Croats occupied most of the Istrian peninsula, including the city of Pola. The new Republic of Croatia was internationally recognized in January 1992 and Pola has remained part of Croatia since. The municipal government of Pola – like many other former Italian cities in Istria – officially adopted bilingualism: road signs can be found in both Croatian and Italian and the official name of the city is Grad Pula - Città di Pola. However, these changes have made little difference in restoring the Italianity of the city, and most of the native population of Pola remains in exile. According to the 2001 census, there were 2,856 Italians in Pola, representing 4.87% of the city's population. 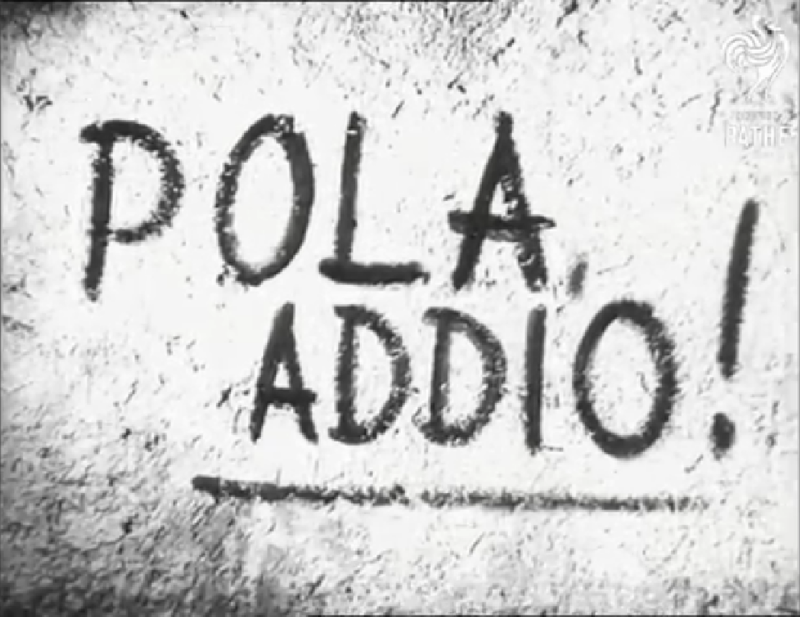 According to the 2011 census, only 2,490 Italians remain in Pola today, just 4.33% of the city's population. The Italian community is officially represented by the Comunità degli Italiani di Pola, which has its own headquarters in the historic centre of Pola. The headquarters has been repeatedly attacked and vandalized by Croats. There have also been numerous attempted arsons. During the negotiations for the accession of Croatia to the European Union, the Istrian Exiles asked the Italian government to demand either compensation or the return of private property stolen by the Croats in Pola and the rest of Istria after World War II. However, the subject was not resolved. The Italians of Pola who are still living in exile are officially represented by the Libero Comune di Pola in Esilio (Free Commune of Pola in Exile) with its headquarters in Trieste. Today the Italian Exiles are still awaiting the return of their homeland of Istria.